In December 2011, the Central Texas community of Groesbeck received an unexpected and unappreciated Christmas present: The small town of about 4,300 was about three weeks away from running out of water. With the entire state experiencing exceptional or extreme drought for most of 2011, Groesbeck stood out as a warning to other Texas communities about what they could experience if or when the next drought of record hits the state. Farmers, cities, water suppliers and state agencies wrestled with the driest one-year drought in Texas’ recorded history. Reservoir levels dropped, aquifers declined, wells went dry. Satellite imaging conducted by NASA showed that the state lost more than 100 cubic kilometers of water storage, equivalent to filling Lake Travis 70 times. As of January 2012, officials from 1,010 water systems were asking customers to restrict water use, with 647 systems implementing mandatory water restrictions. At one point, 23 water systems were on the Texas Commission on Environmental Quality (TCEQ) list of high priority water systems that had 180 days or less of water. TCEQ received 15 senior water rights calls, resulting in curtailment of about 1,200 junior water rights because not enough water was available for both senior and junior water rights holders. Under the current Texas law, senior water rights holders, based on the date of the permit, have priority over junior rights holders, who obtained rights to the water at a later date. Communities like Groesbeck that have a single source of water—which is the majority of public water systems in Texas—suffered the most. In July 2011, Gov. Rick Perry issued an emergency disaster proclamation for the drought, giving state agencies some flexibility in expediting drought-related actions. The Texas Legislature also gave TCEQ more flexibility in managing water rights. State agencies pulled together to provide technical assistance and help communities through the drought. TCEQ took the lead in orchestrating these efforts. According to Linda Brookins, director of TCEQ’s Water Supply Division, the agency formed an in-house drought workgroup that met weekly to discuss the drought and ways to respond to it. TCEQ, the Texas Division of Emergency Management (TDEM) and the Texas Water Development Board (TWDB) formed the Emergency Drinking Water Task Force to work with other state partners to develop the Emergency Drinking Water Contingency Annex. This annex is a supplement to the State of Texas Drought Preparedness Plan and details management and response for public water systems with 180 days or less of water supplies. That coordination with other state agencies, Brookins said, was critical in helping communities deal with the drought. "It worked, and it worked really well for us this year," she said. Once TCEQ staff realized that some communities were within 180 days of depleting their water sources, they began working with these water systems. Each system was assigned a project manager who kept in close contact with the water system staff through weekly calls to discuss ways to fund new infrastructure, raise rates or convert a private water system to a water supply corporation, she said. "Several systems put us on notice when other options were not available to them anymore because they were so close to running out of water," Brookins said. "In some cases we had to get very creative in working with them on how to prevent them from running out of water. "In one case we took some of our equipment out to a town and taught them how to do stream measurements to measure their stream flow to determine how much time they had left in their reservoir," she said. "A lot of counseling went on about their drought contingency plans and moving to higher stages for conservation and making water last longer," Brookins said. Public water systems must have drought contingency plans in case of drought or similar water shortages. Groesbeck was an example of the level of involvement and creativity the agency had in helping community water systems—especially those on the 180-day watch list. 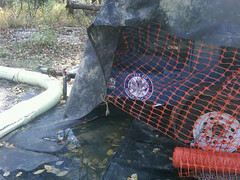 Agency staff helped identify trucks to haul water to the community, coordinated with other state agencies to obtain priority status in grant or loan funds for Groesbeck, helped borrow a water pump from the city of Nacogdoches and located two quarries upstream that could provide water, Brookins said. Coordinating with the Texas Department of Transportation, TCEQ was able to get easements to lay a temporary water line for Groesbeck approved within a day, she said. As each community resolved its problems, Brookins said, the agency moved it off the 180-day list. "If we identified a new source of water and the community confirmed it got it and it was in place and working, we moved the community to a watch list," she said, "and we continued to watch in case we needed to move the community back to the 180-day list." Communities that secured additional water supplies were moved to a success list. 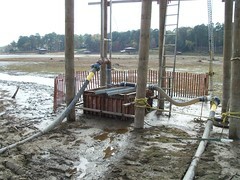 TWDB provided communities with information on the state and federal grant and loan programs available to build water storage infrastructures and helped them find additional water sources, such as brackish water, and improve existing water supplies, such as lowering water pumps in their surface water intakes, according to Darrell Nichols, project lead of the TWDB Project Oversight Division. For example, Nichols said, the board worked with the Texas Department of Agriculture (TDA) and U.S. Department of Agriculture’s Rural Development to assist the West Texas city of Robert Lee in getting funds to obtain water from an adjacent community. With those funds Robert Lee was able to construct a 12-mile pipeline to Bronte. In November 2011, Texas voters approved Proposition 2 that allows TWDB to issue up to $6 billion in general obligation bonds at any one point in time to help communities address infrastructure needs. This ability further expanded the board’s arsenal of funding programs. In addition, TWDB was able to provide direct technical assistance about groundwater to water suppliers, said Dr. Robert Mace, TWDB’s deputy executive administrator for water science and conservation. With its groundwater monitoring network and thousands of measurements of well levels, Mace said the agency can help communities troubleshoot their systems. "If they are having problems with their well, they might think the aquifer has dried up," he said, "but we can look at our database and see the aquifer has not dried up; it might be something wrong with the mechanics of the well or the hole itself. " 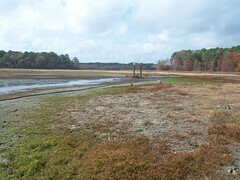 During the 2011 drought, many communities that were relying on surface water asked TWDB for help in looking for alternative supplies of water, Mace said. "We can go into our database and let them know what the odds are of them being able to drill a well locally," he said. "We did quite a bit of that last year." With the attention the 2011 drought brought to communities’ water needs, agencies examined steps that needed to be taken if the drought continued through 2012 or for the next inevitable drought. Texas Lt. Gov. David Dewhurst asked the Senate Natural Resources Committee to study aspects of water supply issues in Texas, including impediments to implementing the state water plan, alternatives to using surface water or groundwater to generate electricity and extraction of fuels and recommendations on the groundwater management. Texas House Speaker Joe Straus gave similar charges to the House Committee on Natural Resources. The committees will issue these reports immediately before the next legislative session, which begins in January 2013. TCEQ, TDEM, TDA, TWDB and the Texas Water Infrastructure Coordinating Committee teamed up to hold workshops in the spring and early summer of 2012 to help water utility operators plan for emergency water shortages. Charlie Adams, technical specialist for TCEQ’s Small Business and Local Government Assistance Program in the Beaumont region, conducted many of the workshops. He urged water system operators to look at their drought contingency plans to see if the triggers for restricting water use made sense in light of increases in population and last summer’s brutal heat, according to an article in the spring issue of TCEQ’s publication, Natural Outlook. He challenged operators to review their emergency plans to identify well drillers, alternative sources of water and possible interconnections. "We encouraged people (at the workshops) to still conserve and to anticipate that we might have another summer like we did last year," Brookins said. In many cities outdoor water restrictions continued into the spring and summer of 2012. One water supplier with foresight to plan for the next drought and look for new supplies is the Colorado River Municipal Water District, Brookins said. The district is working on a project to interconnect West Texas communities by drilling 21 wells in a new field. "They are really designing a regionalization system where they are going to pump water from reservoirs as well as use this groundwater," she said. "Our water supplies are not where they were last year, so we might have a much harder drought this summer than we did this past summer because our water supplies have not recovered in many locations in the state," Brookins said. "I still have systems struggling even though we have had rain." Although each regional planning area of the state water plan has strategies to meet its future water needs, implementation of these projects requires money—money that many communities do not have or want to spend. Strategies in the state water plan include implementing water conservation programs, developing new groundwater or surface water supplies and building water reuse or desalination plants. Mace said implementing those strategies ultimately falls on the local water providers. "To implement water plan funding is a key issue, but there needs to be a local charge to make it happen," he said. "The state creates incentives and opportunities and information, but ultimately local water providers have to step up and ensure reliability and security of water supplies. The key is not to wait until there is a problem." 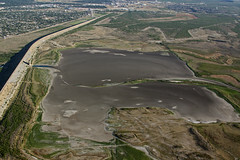 Both Nichols and Mace encouraged communities to use problems discovered during the 2011 drought to evaluate and plan for the next ones. "I do think last summer was a wake-up call for communities, particularly for those communities with a single source of supply," Nichols said. "Every community needs to reevaluate its drought contingency plan to ensure it is adequate to address the continued drought, and if there is anything it needs to do, now is the time to do that planning and secure that funding so that it can do the construction because it is very difficult to do those things overnight." Mace urged communities "to take a look at what happened last year, which was the fiercest one-year drought on record, and also think about the drought of record, picturing five years of drought with the sixth year of drought similar to the year we had last year. The point is the drought of record was a lot worse than last year. "We have seen droughts far worse from a water supplies perspective than we saw last year, so water suppliers should always keep that in the front of their minds when they are thinking of their water supplies," Mace said. "All it takes is one Texas community to struggle with its water supplies to reflect poorly on Texas as a whole."